Heather Barr and Amanda Klasing are senior women’s rights researchers at Human Rights Watch. LONDON/WASHINGTON DC, Nov 15 2017 (IPS) - “I never come here, just because of boys,” Atifa says, pointing at the door of the stall. “They’re opening the door.” Atifa, a sixth grader in Kabul, Afghanistan, attends a school of 650 girls. Since they study in tents in a vacant lot, the only toilets the girls have access to are on the far side of the boys’ school next door. The school is one of a very few for girls in the area, so some students walk over an hour each way to get there. The toilets in the boys’ school consist of two separate blocks of pit toilets with four stalls per block. Both blocks are used by the boys, none of the stalls have locking doors, and none are reserved for the girls’ use. On the day Atifa showed Human Rights Watch around, the floors were awash with urine and feces. The school’s only water point—for drinking, handwashing, and any other uses— is a several-minute walk down a hill. Girls using the toilets have to cope with sexual harassment from male students on the way there, and boys trying to open the stall doors while girls are using the toilet. 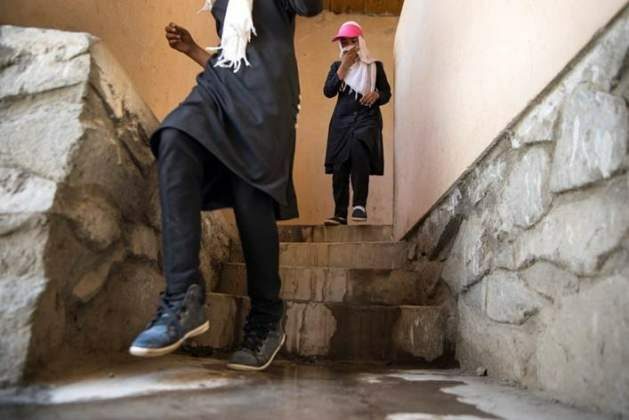 When we interviewed girls, parents, and experts about this situation for a new report they said that lack of access to toilets is a major barrier to education for girls in Afghanistan. Sixty percent of schools here do not have toilets, 85 percent of out-of-school children are girls, and two-thirds of girls ages 12 to 15 are out of school. Lack of access to toilets is a major barrier to education for girls in Afghanistan. 60% of schools here do not have toilets, 85% of out-of-school children are girls, and two-thirds of girls ages 12 to 15 are out of school. Lack of access to clean, safe, private toilets is a major barrier around the world to girls like Atifa, and it’s an issue that disproportionately affects girls. No child should have to attend a school without toilets. But put bluntly, where toilets are not available it is easier–and more socially accepted–for boys to urinate outside than for girls, even in countries with far less strict views on girls’ behavior than Afghanistan. When girls reach puberty and begin menstruation, the problem becomes even worse. Without privacy in the toilets, somewhere to dispose of waste or clean reusable hygiene materials, and running water in close proximity to toilets, girls face great difficulty managing menstrual hygiene. This leads many girls to stay home during their periods, and as these absences accumulate, they fall behind on their studies, suffer poor academic achievement, and are at increased risk of dropping out completely. Countries around the world have recognized the need to reach universal coverage for sanitation—put simply people should be able to use a safe, hygienic toilet wherever they are—home, work, the hospital, and, yes, at school. As part of the global sustainable development goals– the 17 goals agreed upon by the United Nations in 2015 as part of a new sustainable development agenda– governments have set ambitious targets to end open defecation and achieve universal access to basic sanitation services by 2030. Such a clarion call is nearly herculean. Six out of every 10 people in the world lack safely managed sanitation. That is 4.5 billion people. Given these numbers, it is easy to conclude a safe toilet is a privilege of the rich and urban, not a universal right. Today is World Toilet Day. An odd thing to celebrate, perhaps. Yet, given those numbers it’s easy to see why we should stop and consider the humble toilet and all the benefits it provides to those who have access to it. For starters, those of us who can use the toilet and wash our hands are at reduced risk of the diarrheal diseases that claim the lives of more than 350,000 children a year. But sanitation is more than just a privilege or a tool to prevent disease. It is a fundamental human right, one that can enable people to realize other rights—like the right to health. For girls like Atifa, a simple, safe and private toilet can be essential to putting education within reach. Governments will face many competing demands as they work to try to reach universal coverage by 2030. In the crush of priorities, there is a grave risk that the most marginalized and vulnerable will be left behind. In Afghanistan and in places around the world where girls have to fight and struggle to receive a basic education, toilets in school for girls should not be lost in the shuffle. The article presents well both the need for safe, fair provision of sanitary services, and the systematic denial of those services to these girls. Gender-appropriate facilities are clearly lacking in Afghanistan and doubtless in many other places. Toilets, however, may not always be the best solution in places where water, plumbing services and sewage infrastructure resources are limited. In rural settings, and in urban ones that are not too population-dense, one solution is to compost human waste. In places like southern Arizona, United States, where water is pumped long distances at great expense (40% of our region’s electrical energy use is reported to be dedicated to pumping Colorado River water uphill to us), a growing minority of residents are composting their waste. To be sure there is a learning curve, but given the benefits (including water conservation and the production of clean, fertile soil), adoption of human waste composting could be one way of affordably making sanitary facilities safer, healthier and more equitable for girls and boys in Kabul, the United States and elsewhere.